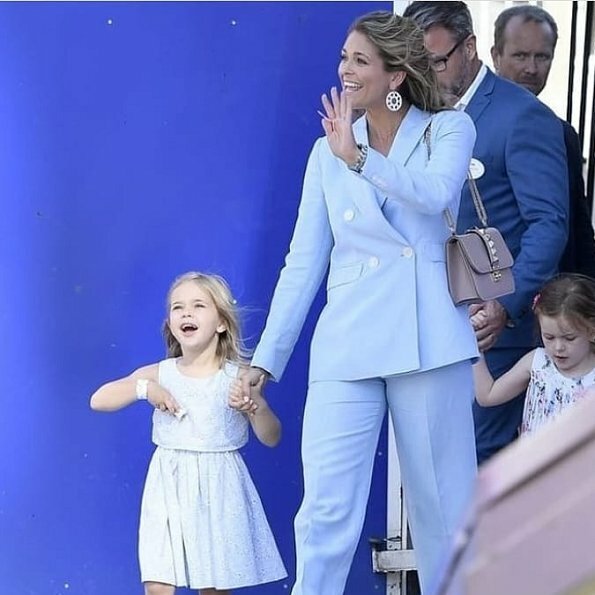 Princess Madeleine of Sweden and her daughter Princess Leonore attended Childhood Day 2018 held at Gröna Lund theme park in Stockholm. Childhood Day has been held annually for 15 years in Gröna Lund. The purpose of that event is to make children under the Foundation's care spend a fun day and to give them the chance to be a child, and in addition, to raise Money for the activities of World Childhood Foundation. 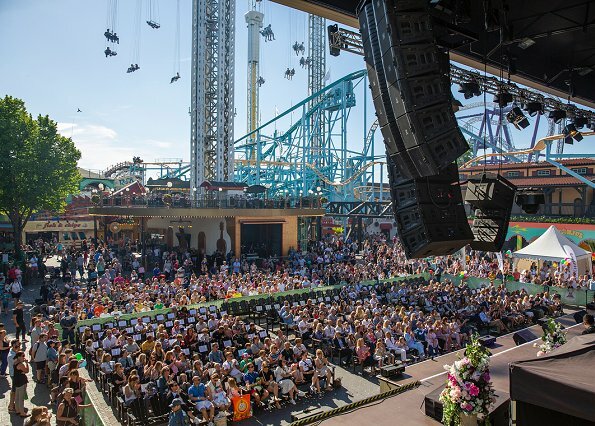 On that special day, all entrance fees of Gröna Lund are donated to Childhood Foundation. Unusual outfit for Madeleine. I don´t think it´s all that flattering on her, but somehow I still like seeing her in something different. And while the trouser legs are too wide, I like them muuuuch better than her usual skinnies. Doesnt fit her justiça right but that colors looks amazing on her. Madeleine looks brilliant …… and I like, when clothes have a slightly different detail, like here the width at the bottom of her pants! She is so beautiful and never bored dressed! Perfect. And more beautiful irl. Pss Madleines suit is very nice but the pant legs are to long she looks good in it. The little whirlwind Leonor had the best of times alone with Mama,I think,she did not have to share Mama with the other siblings. I think we would all die of astonishment if Victoria let her hair loose like Madeleine. Indeed. They also have such a big resemblance but you do not recognice it when they keep their hair so different way. Madeleine looks wonderful. 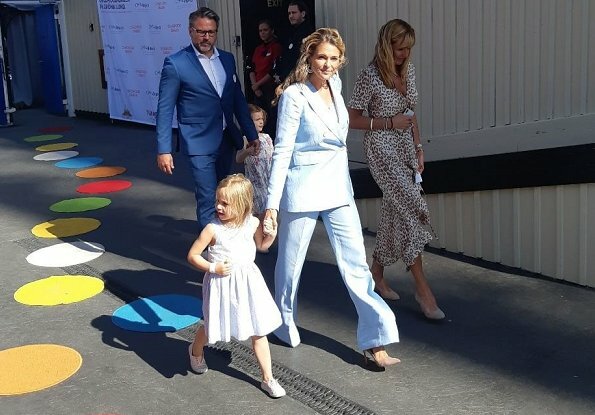 Leonore and she had so much fun, nice to see the little Princess at an official event. I think Madeleines look this day was both, elegant and perfect for a fun day with her daughter. Princess Madelaine looks stunning. Bratiful color. Love the styl of the jacke. On all the photos the same exaggerated laughing! Exaggerated laughing??? In what way may I ask? For me it looks like she's truly having fun. Its good when people show their enjoyment with laugh and smile, and aren't a sourpusses who's too rigid to enjoy the moment. Of course you may ask, although I find it surprising that in your whole entire life you did not experience that there is a wide range of facial expressions from the face of a "sourpusses" to the performer in a commercial. I just have the impression that this woman is pretending. As if she wanted to proof something. I don´t want to offend....in some ways it looks like Queen Maximas smile. Victoria and Maxima also have big smiles and expressive faces but they are not pretending? Only Madeleine is performing to the audience, she shouldn't laugh? Its very offending, especially as we don't know these royals personally, thus you can not be sure that she's pretending to be happy or having fun! She should just politely smile just because she's a royal and not allowed to have fun? It definitely looks like they had lots of reasons to laugh there. The situations they were into made reasons to have more expressive facial expressions imho. I like to see people having fun! Very odd comment to post..."exaggerated laughing". When something/someone has made me laugh/I find something amusing, then I laugh the same way. Ups. I shouldn't it seems! Are we really so used to those stone-faced celecrities, their botox-frozen faces that won't allow them to laugh like this, so someone's rolling belly-laugh makes us question their motives? Sad. I just love both of them. So happy pictures and I actually love Madeleine's outfit. She looks gorgeous as always. And Leonore is super cute. Some tweaks needed to fit it just right to the Princess but it is a beautiful suit and the colour is beautiful on her. They both look very lovely. Great colors. She is beautiful, this lighter and softer hair color is very becoming to her. Schade, daß Leonore nicht Mamas tolle Haare geerbt hat, sondern wohl die von Eva O'Neill. Ansonsten zuckersüße Bilder von zwei wunderschönen Prinzessinnen. Freut mich sehr, die beiden zu sehen. The color is flattering on Madeleine, but that's it. 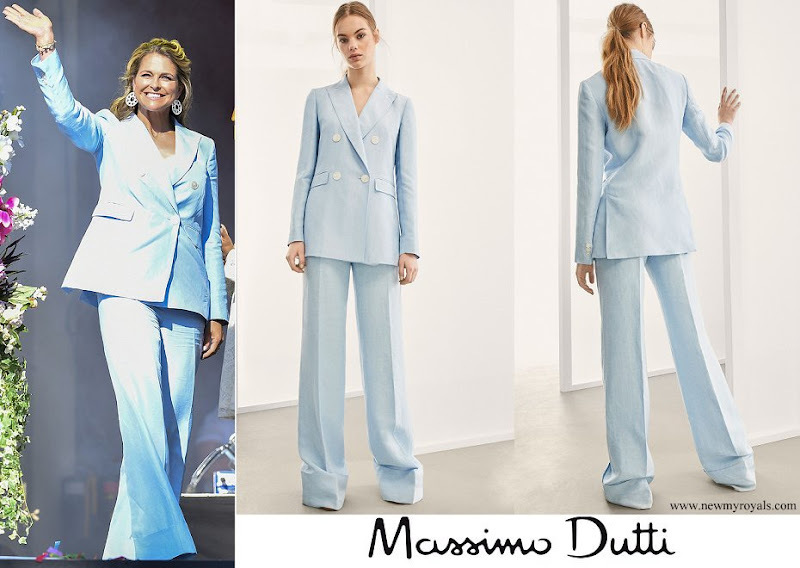 The suit doesn't look good on her.